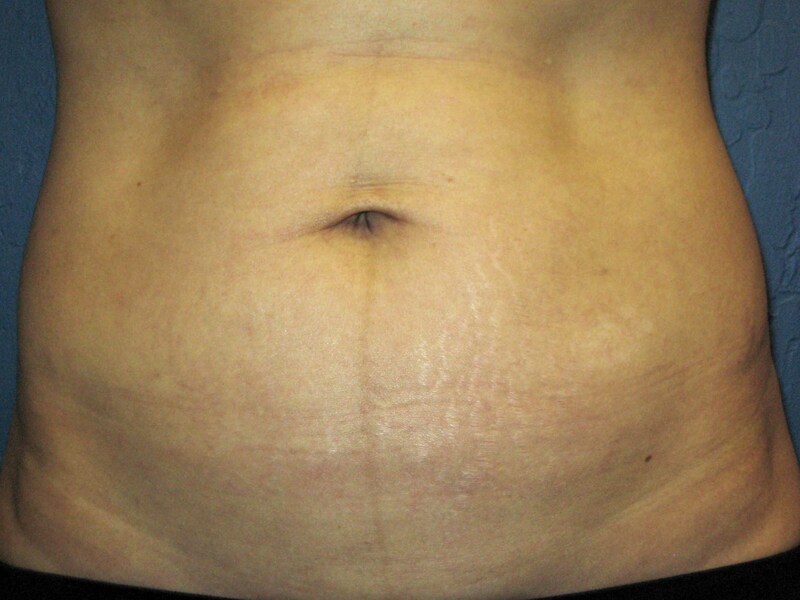 At the Arizona Center for Aesthetic Plastic Surgery, an abdominoplasty (tummy tuck) is the procedure I select in order to rejuvenate the appearance of the abdomen with lax skin and that usually is protuberant. A major component of this operation involves the elevation, redraping and removal of excess skin employing an incision in the inguinal area that usually extends from hip to hip. This will provide for a firmer and tighter skin envelope but it will not address the bulging out of the underlying tissues. What is the etiology of this protrusion and how can it be treated? The bulging is caused by laxity and separation of the underlying muscle layers that are most often the consequence of pregnancy, considerable weight loss, aging or a combination of these factors. Most commonly, the increased separation between the rectus abdominis muscles, particularly in women who were pregnant, is responsible for the majority of the bulging. At times the separation can be so significant and the tissues so thin that a ventral hernia develops further exacerbating the deformity. Unfortunately, all the sit-ups in the world will not bring these muscles closer together again – only surgery will. The solution involves the surgical retightening of the muscles of the abdominal wall in a horizontal direction to variable degrees in order to obtain more feminine contours in women or masculine ones in men. An analogy can be made with tailoring clothes by using hems and pleats so that they fit better. With the skin tightened to firmly drape over the sculpted muscle layer, an alluring appearance can be the result. If you would like more information on an abdominoplasty, liposuction or any other plastic surgery procedure that I perform or to schedule a free cosmetic consultation with me, please contact my office at 480-451-3000. Steven H. Turkeltaub, M.D. P.C.